During my rant on Annabelle this past week on the site, I mentioned that screenwriter for “Annabelle” Gary Dauberman wrote the screenplay for the film “Swamp Devil”. It turns out that I did review for that film back in 2009 for my column “Reviews from the Horror Chamber” column. No wonder why “Annabelle” sucked, because his guy makes his characters in his screenplay feel lifeless. If I knew about this before than yours truly went to the theaters this past weekend, then I probably wouldn’t have gone and seen the film. And by the way, I estimated that “Annabelle” cost under $15 Million to make but I thought the film actually cost under $10 million to make. According to Box Office Mojo, the film cost $6.5 million to make. Proof why “Annabelle” was a lazy effort from Warner Bros.
Repost from 4/23/2009 with changes. “Swamp Devil is about a woman (Cindy Sampson), who returns home after finding out that her father (Bruce Dern) is on the run for the string of bloody murders that are occurring in a small town. As she finds out more about her father’s past, a sheriff get murdered in the swamp. Soon, everyone in the town will begin to discover that an unstoppable monster is responsible for all this. Now it’s up to her and her father to stop it, before it wreaks havoc on the town. Sometimes, you get a feeling that you’re going to be in for a bad movie ten minutes into the film. That’s the exact same feeling that I had with “Swamp Devil”, as the tagline for this film should be changed to “Bad Movie Lies Beneath the Surface”. “Swamp Devil” is a film that very predictable made for TV like film, as this really felt like a film that you would see on the Sci-Fi Channel. Oops, I ment “SyFy”, as that’s what network wants to be ridiculous known as now. The direction seemed lifeless, as I was really bored watching this film. Director David Winning, doesn’t do a good job with any of the action scenes in this film, as this film felt like it had no suspense whatsoever. He doesn’t even do a good job with the material that he’s given to even make this a mindless fun film. I was not having fun watching this film, as kept wanting it to end. Winning’s direction of his actors weren’t even good. The actors felt like they were really bored, considering the script that was very bad to be with. That’s what happens, when you script that has characters that are clichéd and lifeless with a story that’s predictable. Speaking of the screenplay, it was every bit as bad, as one of those made for cable movies. Screenwriters, Gary L. Dauberman and Ethlie Ann Vare never cared about making a film that has suspense and twists, because everything was predictable. That’s what made this film sink into the land of cable television. It was like, you knew who are the bad guys are and the upcoming twists fifteen minutes into the film. The screenplay doesn’t do anything to make this film fun, as they don’t develop any of the film’s characters and the fact that the story has this lifeless and convoluted tone to it. It made lose interest very quickly. Combine that with the fact that some of the dialogue felt so cheesy, you have a film that is uninteresting, unentertaining, and painful to the point that you kept waiting for something shocking to happen. That’s not how you make a fun b-horror film. 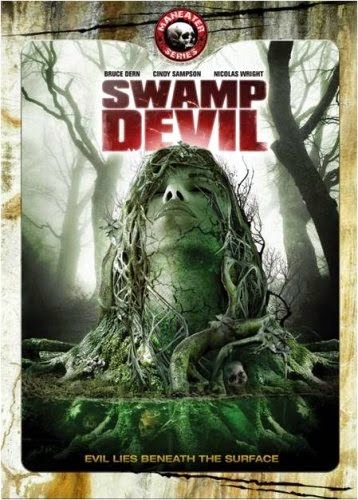 “Swamp Devil” is a film that should have been a film left for cable television and SyFy, not on DVD or in my collection.